Do you ever read or hear a question and your brain focuses on just one part of it? I did just recently and it brings home how confusing the sewing machine attachments can be, especially when you are just learning. It really is like a different "lingo" at times! I was recently asked if a zigzagger would allow a Singer straight stitch machine produce lovely zigz ag stitches, machines such as the Singer 201, 221, 99, and others. My brain immediately answered the question about zigzaggers in general, but really didn't take into consideration the "newer" zigzag foot. The top photo, second from the right is a zigzag foot. The wide area in the foot allows you to view your sewing better, and has a wide needle hole for your zigzag. This foot is used on machines which have the zigzag capability built in - not on a straight stitch sewing machine. 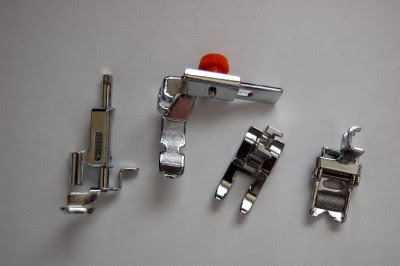 The next photos are examples of various types of zigzagger attachments. Each one will allow a straight stitch sewing machine sew a zigzag stitch. Some have cams to provide more decorative stitches, while others (bottom photo) only does the zigzag stitch. Whichever one you choose, your straight stitch will have new capabilities!